Why Should I Buy a Tall Rollator? A rollator can help you to maintain your independence by allowing you to continue walking by yourself without the help of a friend or caretaker. Instead of relying on an unstable cane or letting yourself get slowed down by an awkward walker, you can use the wheeled frame of a rollator to travel by foot without trouble. Height can pose unique challenges for mobility impaired individuals, making the already difficult task of walking seem nearly impossible. Many standard rollators aren’t able to adjust to a height that’s suitable for taller individuals. Luckily, tall rollators are designed to accommodate the needs of people over six feet who have trouble reaching standard sized rollators without stooping. Tall rollators have adjustable handlebars that can reach impressive heights, often more than 40” above ground level. This prevents taller individuals from having to bend at an uncomfortable and unhealthy angle to grip the handlebars. Over time, a handle that’s too low can lead to hip and back problems. Tall rollators can support users without forcing them to compromise their comfort or posture. If you are above average height, you’ve probably found that standard sized rollators don’t feel comfortable, or perhaps they even cause you aches and pains. There are several benefits to purchasing a tall rollator, but keep in mind that there are some minor drawbacks too. Supports Good Posture. Handlebars that are at the right height can help you to maintain a good posture and prevent future back problems. Safe. On top of preventing back problems, a rollator that is the right size can reduce your risk of accidental slips and falls. Sturdy. Tall rollators are built and reinforced to support extra weight. Smooth. Tall rollators are often built with oversized wheels that absorb more shock than standard sized wheels. Heavy.Since tall rollators are often bigger, it probably comes as no surprise that they’re usually heavier than standard sized rollators. Heavier rollators can be more difficult to move and may reduce your stamina as you walk. Expensive. Because tall rollators are often larger and sometimes reinforced, they tend to cost a little bit more than their standard sized counterparts. As a tall individual, the height of your rollator is probably your main concern when selecting the right model. You need a rollator with handlebars that adjust to a level where you’re not bending at an awkward angle to reach the grips. The height of your rollator’s handle bar should ideally be at your hip joint for optimal comfort. The seat height of a rollator is also important if you are tall. Maneuvering in and out of a seat that’s positioned too low down can lead to slips, falls, and strain the knees or lower back. A seat that is adjusted to your height level allows you to sit safely and comfortably. 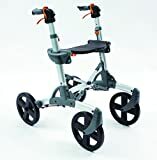 Instead of the standard six-inch wheels that most rollators have, many models designed for tall individuals have eight to ten-inch wheels that better fit the walker’s larger size. You should look for tall rollators that have larger wheels, as anything too small can compromise the stability of the device. Larger wheels also act as shock absorbers, providing better cushioning for bumpy or rugged terrain. There are hundreds of different rollators on the market, so how do you know which one is best for you? If you are taller than average, it can be difficult to find a rollator that is both durable and functional. We recommend these high-quality rollators for anyone who finds that they are too tall to fit standard sized models. The Nitro Euro Style Rollator offers comfort and functionality without sacrificing style. Its sleek frame comes in black, white, or red with a plush seat and a removable backrest. Large, 10” front caster wheels allow you to drive this rollator in all sorts of terrain, both indoor and outdoor, while smaller back wheels and a forked design enhance maneuverability. The frame of the tall Nitro Euro Style Walker has a seat height of 23.6”, slightly higher than that of standard models, while the handlebars are adjustable between 36” and 41” at just the click of a button. You easily can fold the entire frame with just one hand whenever necessary. All-Terrain, cushioned, slightly softer rubber tires and ergonomic shaped, non-slip hand grips. The Volaris All-Terrain Smart PATROL Fitness Rollator is designed for the active adult, providing an uninterrupted ride across any type of terrain. Cushioned rubber tires and ergonomic handles absorb shock, while a flexible frame and ball bearings offer a smooth ride across rough surfaces. Brake cables are hidden within the frame to prevent accidental snags. This rollator can be used by people of all sizes, with handles that adjust from 32” all the way to 42”. The seat is also adjustable between 20” and 26” off the ground. The Smart PATROL Fitness Rollator has a sturdy X-shaped frame that allows it to fold into an ultra-compact design that you can take with you anywhere. It’s the ideal rollator for the mobility impaired individual on the go. Adjustable handle height with handbrake locks. Recommended user's height 5'4" to 6'4". This rollator brings a touch of class to its design with a metallic champagne frame and chic black accents. The Comodità Prima Heavy-Duty Rolling Walker features a padded seat and backrest along with comfortable, ergonomic brake grips. This rollator can support impressive amounts of weight, safely holding up to 400 lbs with its reinforced frame and wheels. It can also accommodate individuals up to 6’4” in height with its adjustable handlebars. Oversized 8” rubber wheels offer a smooth ride as you walk, passing evenly over dips and bumps and providing superior grip during braking. The Dolomite Futura is a sturdy model of rollator that’s built to withstand all sorts of wear and tear. 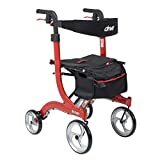 Its durable steel frame can support up to 350 lbs in weight, while a stainless steel brake system located within the fork of the rollator can last through years of heavy use. This rollator is designed with individuals over 6’2” in mind and has handles that adjust between 37.75” and 43.5”. The seat is also located at a greater height than found in standard rollator models, resting at 27.5”, and flips up when needed to offer more space for walking. Although this is a heavy-duty rollator model, it is still designed to fold neatly. When in its compact form, the Dolomite Futura takes up a space of just 44.25” X 25.5” X 12.5” and can easily fit in a closet, car, or suitcase. Flip-up seat with built-in handle. The Blue Tall Adult Rollite Rollator from Invacare is a great choice for tall individuals with mobility impairments. It’s made for people between 5’9” and 6’6”, with handlebars that adjust between 35” and 39” in height. The seat is also adjustable between the heights of 22” and 26” and can hold up to 300 lbs. This rollator is not only comfortable due to its size, but also its design. The flexible backrest provides support while allowing you to relax, while a contoured seat molds to the shape of your body. The lightweight assembly only weighs 16.5 lbs, making the rollator easy to move around your house, the supermarket, or anywhere else. The midnight blue frame of this model is foldable, making it easy to store and transport. The seat even flips up to form a convenient handle that allows you to take your rollator with you wherever you go.